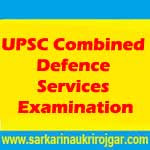 UPSC CDS I 2018 – Apply Online for 414 Vacancies:- Union Public Service Commission (UPSC) has published latest notification for recruitment of 414 Various Vacancies in Indian Military Academy, Indian Naval Academy, Air Force Academy and Officers Training Academy through Combined Defence Services Examination (I) 2017 [Including SSC Women (Non-Technical) Course]. Desirous & eligible candidates can apply online from 08/11/2017 to 04/12/2017. UPSC CDS I Exam 2018 details is given below. For IMA : Unmarried male candidates born not earlier than 02/01/1995 and not later than 01/01/2000 only are eligible. For Indian Naval Academy : Unmarried male candidates born not earlier than 02/01/1995 and not later than 01/01/2000 only are eligible. For Air Force Academy : 20 to 24 Years as on 01/01/2019 i.e. born not earlier than 02/01/1995 and not later than 01/01/1999. For Officers’Training Academy (SSC Course for Men) : Male candidates (married or unmarried) born not earlier than 02/01/1994 and not later than 01/01/2000 only are eligible. For Officers, Training Academy -SSC Women Non-Technical Course) : Unmarried Women, issueless widows who have not remarried and issueless divorcees (in possession of divorce documents) who have not remarried are eligible. They should have been born not earlier than 02/01/1994 and not later than 01/01/2000. For I.M.A. and Officers’ Training Academy – Degree of a recognised University or equivalent. For Indian Naval Academy : Degree in Engineering from a recognised University/ Institution. Application Fee: Rs. 200/- either by depositing the money in any Branch of SBI by cash, or by using net banking facility of SBI, State Bank of Bikaner & Jaipur/State Bank of Hyderabad/State Bank of Mysore/State Bank of Patiala/State Bank of Travancore or by using Visa/Master Credit/Debit Card. (Female/SC/ST candidates are exempted from payment of fee). Starting Date of Online Application : 08/11/2017. Last Date of Online Application : 04/12/2017. Application Procedure: Eligible Candidates can apply Online through the website http://www.upsconline.nic.in from 08/11/20176 to 04/12/2017.